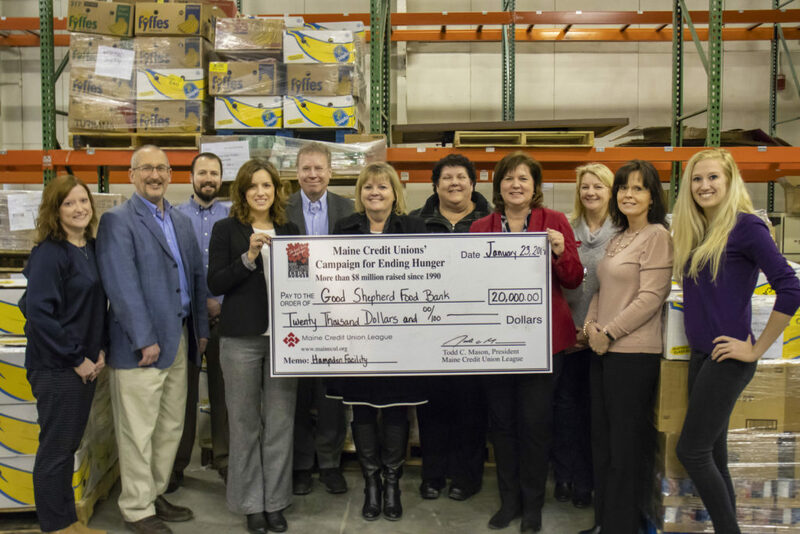 On Wednesday, January 23, the Maine Credit Union League joined representatives from Good Shepherd Food Bank at their Hampden Distribution Center, located at 11 Penobscot Meadow Drive in Hampden, to present the organization a check for $20,000 to support their renovation efforts. Last year, Maine’s Credit Union’s Campaign for Ending Hunger pledged $100,000 to support the facility’s expansion plans. This donation was the second contribution given to Good Shepherd Food Bank within the last year to fulfill that commitment. Good Shepherd Food Bank purchased the former Bangor Daily News printing plant in 2015 and has only been using a portion of that facility for its food distribution operations since 2016. With the help of partners like Maine’s Credit Unions, the Food Bank has a $5 million Food for All capital campaign underway to fund significant renovations that will transform the facility into a food distribution center. Once complete, the distribution center will help the Food Bank more efficiently and equitably serve neighbors in Downeast, central, and northern Maine. To date, the Food for All campaign has raised $3.9 million. Upon completion of the facility’s renovation, the food bank will have the capacity to distribute an additional 10 million meals per year, on top of the 25 million distributed annually today. The building’s new packing area will be officially dedicated as the Maine’s Credit Unions Food Packing Area. Members of the media are invited to attend the check presentation with the Maine Credit Union League. Since 1990, the Maine Credit Unions’ Campaign for Ending Hunger has raised over $8 million, including a record-breaking $740,000 raised during 2017. The Campaign will announce its 2018 fundraising totals at its annual Ending Hunger luncheon taking place in February. The Maine Credit Union League is a nonprofit, professional trade association that exists to serve Maine’s credit unions. Founded in 1938, the League’s mission is to help credit unions succeed and improve the financial lives of their members. As the trade association for Maine’s credit unions, the League provides advocacy, education, and other resources designed to assist credit unions in meeting the needs of their membership. For more information, visit www.mainecul.org.